In 2045, Wade Watts (Tye Sheridan) is a teen whose parents have died. He lives in an over-populated city where his only escape is an immersive virtual universe called the OASIS, created by a man named James Halliday. There, he and many others of his generation can participate in a game that includes all of their favorite characters from bygone years. They make friends, they fall in love, they live full lives – there's no limit, as long as they can imagine and conjure it. 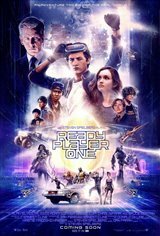 When a contest to take over the OASIS is announced, Wade teams up with fellow player Samantha (Olivia Cooke) to win complete control over the virtual universe.